Facebook has stepped up in the local community to bring solar panel installation within reach of those in low-income neighborhoods. Menlo Spark, Facebook, and GRID Alternatives Bay Area have completed solar power installations for 10 low-income homeowners in Menlo Park’s Belle Haven neighborhood. Additional funding from Facebook will bring clean, renewable energy to 15 more homes in this community. 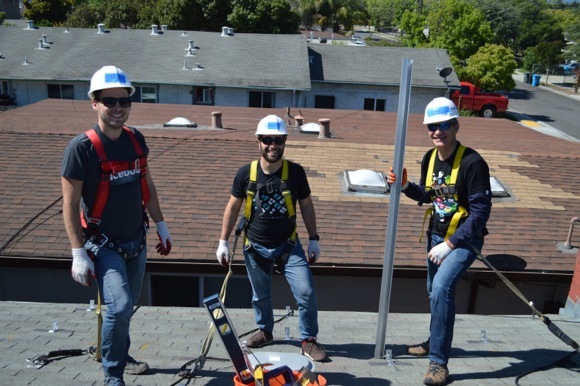 With the tenth solar installation, the program, which began in March of this year with help from the City of Menlo Park, will have installed 32kW of solar power, saving over $6,000 per year for those homeowners and reducing over 300 tons of carbon emissions. Additional funding from Facebook will bring clean, renewable energy to 15 more homes in this community. With the tenth solar installation, the program, which began in March of this year with help from the City of Menlo Park, will have installed 32kW of solar power, saving over $6,000 per year for those homeowners and reducing over 300 tons of carbon emissions. “This is very good for us, since we are retired and it will help us save on our electricity,” said Ruben Berumen, recipient of new solar panels on his Belle Haven home. It’s wonderful to see corporate interests stepping up to empower local residents to become a part of the solution with clean, plentiful and sustainable solar energy.